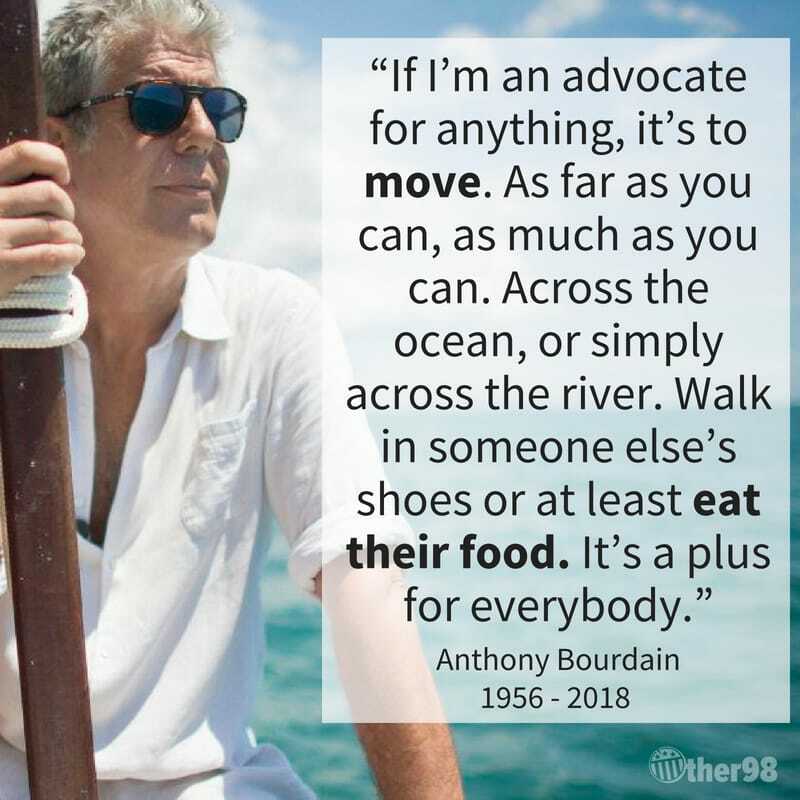 In light of the recent news of Anthony Bourdain there are a few things I would like to say to the community and the world as a whole. I’ll be perfectly honest here, personally I’m not sure I will ever got over the suicide of Robin Williams, there are probably very few people in the world that I would ever say I wanted to be, he was for sure one of them. The fact that life could have been so formidable for him to face that he would chose to end it, instead of living, is still a fact that shakes me to my core. I’m sure the news of Bourdain is having the same exact affect on many of you, for that I offer you my condolences and sympathy for the loss of someone I know many of you had a deep fondness for. I think this is also an appropriate time for use to remember what exactly a site like this is all about; it’s about a discussion regarding something we all have a passion for, which is food. Some of us come here to escape our real worlds; some come here to supplement our real worlds with fresh ideas, new recipes or just the camaraderie of passionate like minded individuals. It is also why civility within our community is one of our pillars. As Bourdain sadly reminds us, we never know what battles any of us are fighting on any given day. We don’t know the struggles each of us face while away from our keyboards. We don’t know how formidable our respective worlds are on any given day. For that I ask you to always try to be mindful, if I put capers in my francese because that’s how my grandmother taught me that doesn’t make is picatta because you say so. (everyone knows it’s also the egg wash….duh!!!) Be mindful and respectful of the ideas that make us different, yet bring us together with our common interests. If you find comments or behaviors which you think are not becoming of the community please always point it out. More importantly if you every feel life is becoming too formidable reach out!! If you don’t know who to reach out to, well, if you’re reading this then you’ve now met me, I’m Bob! If you don’t think you should…………I beg you to reconsider that thinking. Edit - this is a resource not only if you need help personally but if someone ever reaches out to you (general you) with these thoughts you can use them as a resource. This is a very dark space and getting it wrong is devistating. Reach out to a professional for guidance. Thank you for this. I am stunned, sad and furious over today’s news. Depression is an awful, awful disease. All of this. Thanks for posting, @NotJrvedivici - I have to say that I’m shocked by how today’s news has affected me. And right there with you about Robin Williams, too…His was the other passing that really threw me. Not trying to lessen the tragedy of today, but Bourdain doesn’t shock me. Every single time I have looked into his eyes (albeit on TV) I have only seen a tortured soul. Very well said - thanks for posting! I agree—But I honestly thought he might have died from an overdose; maybe that’s what surprised me. Either way, it’s sad. The news of AB’s passing threw me for a loop more than I could have imagined. I wear my heart on my sleeve in certain situations, and even my CEO, who knows I love food and watching and talking about food (and is usually rather cynical) came in to the office this morning and said “I’m so very sorry” after saying good morning to me. And you’ll always be NotJr to me. So maybe now you’ll be NotJrBob. Thanks to JR, we can never be reminded to often that kindness should not be in short supply. I am also right there with you Linda. Taken by surprise at how sad this news makes me. I didn’t realize it, but he was a hero to me. I’m not really the kind of guy that has heroes, but somehow hearing that he would not be around to share more of his adventures in the unique way where he combined compassion with a no nonsense attitude will be greatly missed.